My Alpine deck and 5" Boston Acoustics should have sounded decent but even for small speakers, they lacked the low end response. Why? 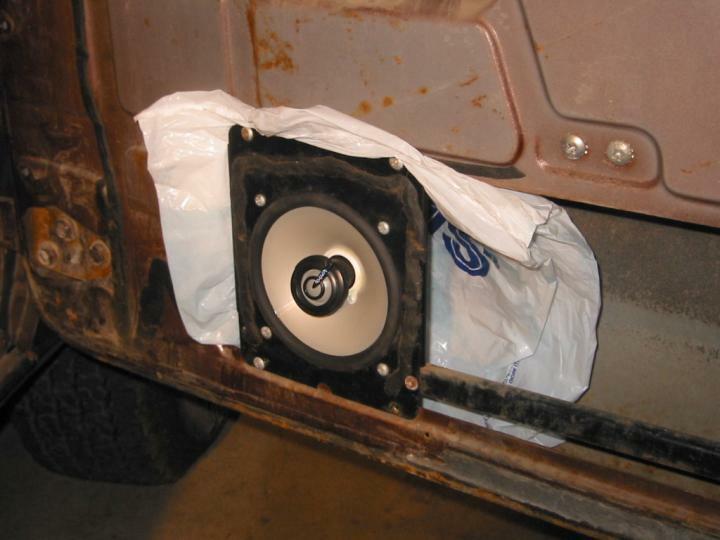 In large part because the OEM speaker installation method leaves much to be desired. 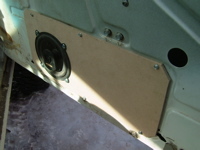 Speakers are mounted on flimsy sheet metal that partially spans a giant hole in the door. To get more out of your FSJ's stereo, read on. You'll need a 4'x4' panel of 1/4" MDF, tape measure, drill, screwdriver, and some self-tapping screws, and allen wrench (to remove the inside door latch handle). Before removing the original sheet metal mounting plate, measure the location for the speaker using the original sheet metal, the door panel, tape measure, etc. 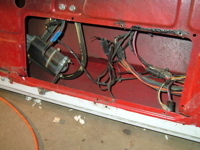 Next, remove the interior door panel and the sheet metal plate. Measure the large door opening. The new panel will be slightly wider and taller so it can screw into the recessed flange around the entire opening. Make a pattern on paper or cardboard to check. Then, cut the panels from 1/4" MDF. Test fit and trim as needed. Now, make a hole for the speaker at the location you measured when you started. I found that there wasn't enough material to work with at the bottom of the new panel so I had to relocate the speakers upward just a bit. They are misaligned with the door, but the OEM speaker covers hide this minor flaw and the tweeters are still exposed so it shouldn't affect sound too much. Trace an outline for the speaker then cut with a jigsaw. Drill holes for speaker screws and mount them up. Lastly, drill holes for mounting screws in the MDF. Mount the board into the door panel hole with self-tapping sheet metal screws. Result? By ear, at least, the mod increased volume and low end response. I suspect the reason is that isolating the front and back of the speakers prevents reflected sound from the back of the speaker from canceling sound from the front of the speaker. 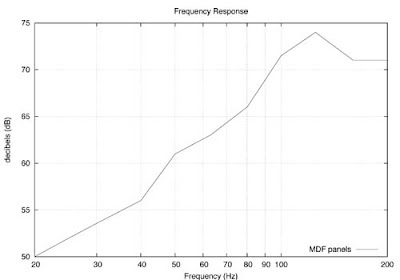 Lower frequencies are probably affected most. I didn't do a "before" test. So... take this with a grain of salt. Tests were performed with a Radio Shack Sound Level meter and Stereophile Test CD 2 for bass test track. I set head unit's volume to produce 71dB at 200Hz with the meter pointing at the right door from the ctr console. Engine was off.